The Best 2 x 2 Matrix Of All Time? Why not use 3 x 3’s ? The answer is that they aren’t as helpful as 2 x 2’s for our purposes. As Stephen Covey told us, “Important questions always get reduced to two options.” A matrix with more cells may be useful for mapping the territory or analyzing decision criteria, but is too broad for crystallizing core issues. What’s your method for analyzing dilemmas? Is there a taxonomy? The answer to that is yes, but it’s lengthy. When we wrote the book The Power of the 2 x 2 Matrix we analyzed nearly 300 2 x 2 models, looking for underlying archetypes and patterns. We’ll explore some of that methodology in a future article. But “what’s your favorite” is still the champ. And, not surprisingly, we have a favorite, sort of. 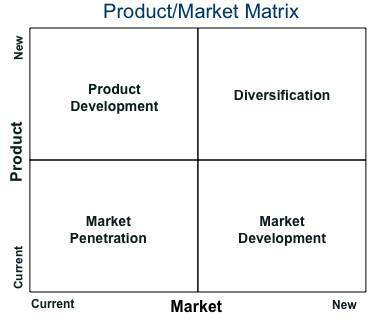 It’s the Product/Market matrix, a 45-year old workhorse that Igor Ansoff sprang on the world in 1965. This tool is so effective because it cuts very closely to what we call the archetypal strategy dilemma—the value proposition. 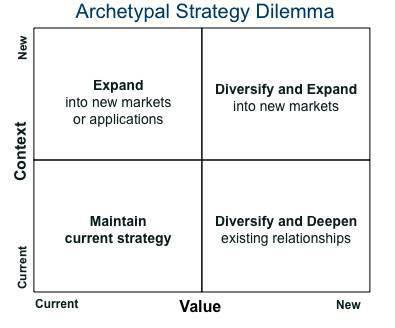 As we say in the book, “The visible strategic act of corporate leaders is making choices that advance the goals of the firm in the best possible way.” In the diagram, the archetypal dilemma is between Context and Value. Context is the way you go about the business—the who, where, when, and why. Value is what you produce—the what. How these issues are framed is the job of a leader. Product: Businesses are defined by their product and services. Modifying them is a key strategic decision. Market: Companies are know equally by their current customers and the markets in which they are known for competing. Choosing to enter a new market is a fundamental strategic issue. Upper left: Product Development. The reputation of a brand enables it to sell new products to existing customers. Dannon, for example, grabbed acres of shelf space in grocery stores by continually pushing out new extensions to its yogurt line (fruit on bottom, no-fat, probiotics, etc). Lower left: Market Penetration: Selling more of the same product to existing customers. A classic orange juice campaign proclaimed “It’s not just for breakfast anymore.” The effort to get existing customers to consume larger quantities, or consume more frequently, is the essence of market penetration. Lower right: Market development. Selling more of your current product or service is ideal when the offering is well developed and some markets are underserved. Exporting is a common market development strategy. Apple provided a great example when it expanded its iTunes software to Windows, opening its products to a much larger customer base. Upper right: Diversification. Sometimes mordantly referred to as “the suicide quadrant” by consultants, diversification is the most costly and risky strategy. Going after new customers with a new product means that a firm must establish new relationships and simultaneously perfect a new offering, taxing its skills and resources. Ideally, firms diversify gradually into areas that are somewhat complementary. It would make more sense for a company that makes earthmovers to get into farm implements than it would to open a chain of restaurants. In the real world firms often combine Product/Market strategies. Dell started with PCs, then expanded into monitors and other equipment (product development). At the same time, the company also began hiring consulting engineers to service top corporate accounts (market development). The ideal time to use the matrix is at the start of a planning cycle. It offers the advantage of being a great brainstorming tool that can easily be used by any team or group of employees. It quickly spurs conversation and engagement. The matrix prioritizes the four basic investment options. Try the method below. 1. Diagnose Define the product/service area for analysis. If you have multiple products or departments, define them separately. 2. Envision Ask the following questions for each of the quadrants, beginning in the lower left. Should our offering stay the same of should it change? Should we focus on current customers or new ones? 3. Discuss Ask questions such as “How would we change the product? What else would our customers like to buy from us? What customer groups are we not reaching today? Assess the attractiveness of the options that arise from the discussion. In most instances, the option that is easiest to obtain is the right priority. 4. Design Build a clear plan of action.